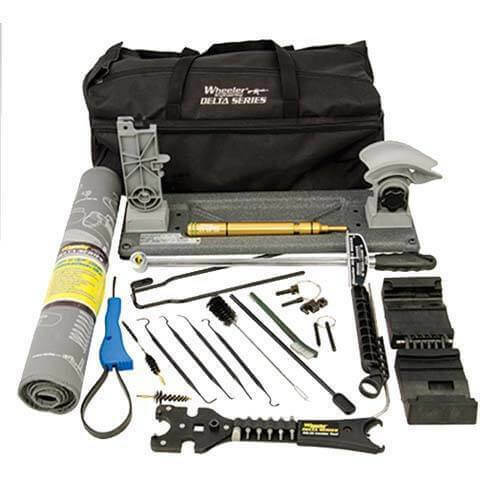 The Wheeler Delta Series AR Armorer’s Professional Kit contains all of the tools a gunsmith or armorer needs to complete a full rifle build, make repairs or perform maintenance on AR-15/M16 platform rifles. Each of these Delta Series tools is designed with application specific features to perform specific functions with precision and ease. Each tool is constructed of the highest quality materials to deliver the best performance at a great value. This all-inclusive 19 piece Armorer’s Kit has some of the most innovative AR-15 tools on the market today, making it the most advanced kit out there. All of the tools fit inside the durable carry case for convenient storage and transport. Very thorough product, made assembly of my AR-15 very simple. Fair price for everything included. Great package, All you need to build and maintain your AR in one custom fitted tool bag. Fair price and fast shipping. If you are new to the world of AR kits, this is a must have. Includes everything you need to properly get started and it's all good quality. Expect to add some small tools if your really going to get into building AR's. Makes a great tote bag for storage of your stuff and going to the range. It would take very close to this cost to build one on your own so this is super convenient and worth it. I would buy one again. I was amazed at the quality of the Armors Kit. It has everything need to work on you AR15. It will be used a great deal here.